Mad Martins has been a long time in the making. 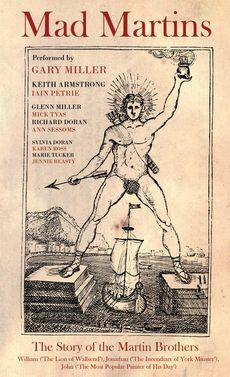 The project was initially conceived by Keith Armstrong as far back as the 1970s, as a performance of poetry and music with an accompanying slideshow, featuring other poets and musicians as well as Keith himself. 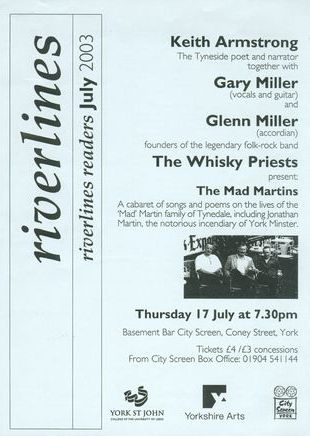 Then, in 2002, Keith approached Gary Miller with a view to updating and developing Mad Martins for a new audience. Quickly enthused and armed with a wealth of research material supplied by Keith, Gary proceeded to pen around a dozen songs in the space of about a fortnight, to add to the various poems Keith had previously written, and a 90-minute set list of material was made available to be presented to a live audience. Mad Martins, in the format in which it existed at that time, was premiered at Queens Hall Arts Centre, Hexham, October 2002 as part of the Northumberland Traditional Music Festival and featured performances by Keith and Gary, accompanied by Gary's twin brother Glenn Miller on accordion and Chris Ormston on northumbrian pipes. 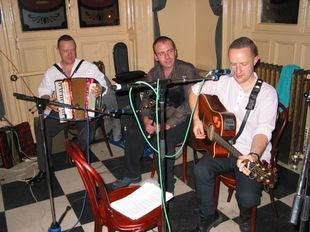 A handful of further performances quickly followed but due to a variety of personal circumstances, the project was shelved for a number of years before it was revived by Gary & Keith in 2011, in time for a performance at the Anchor Hotel, John Martin Street, Haydon Bridge in October of that year, as part of the John Martin Heritage Festival. In addition to performances by Keith and Gary, Chris Ormston renewed his links with the project to perform a selection of northumbrian pipe tunes at the event. During this minor revival of the project, Gary was inspired to conduct further research into the Martin Brothers and to subsequently write an additional batch of songs, taking his tally of songs about the Martins to about two dozen. Then, at the beginning of 2013, Gary decided it was time at last to accord the project what he felt was its rightful due and began initial recording sessions for the Mad Martins album with his friend and previous collaborator Iain Petrie producing. These recording sessions progressed during scattered short spells throughout 2013 at Iain's studio in Berwick-upon-Tweed, Northumberland, during which time around half of the project material was recorded. This included all the northumbrian pipe tunes performed by Ann Sessoms. Then, following a 12-month hiatus, again due to personal reasons, recording resumed on the remaining material, in July 2014, at Iain's relocated studio in Spittal, Northumberland, with additional contributors, such as Glenn Miller, Mick Tyas and Richard Doran coming on board. By this time, initial plans to release the project as a single CD had expanded to releasing the entire recordings as a triple CD with an accompanying 100-page Deluxe Book. 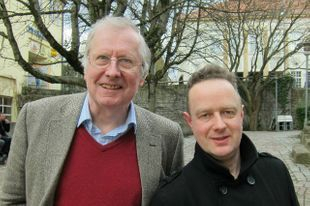 In April 2015, with all recording and mixing completed and the 50-track running order finalised, the project's Musical Director Gary and Producer Iain travelled up to Slate Room Studio in Pentcaitland, to oversee the mastering of the 50-track triple album, over 3 successive days (one for each disc) by experienced mastering engineer Garry Boyle. At this point, however, Gary was forced to abandon his own career plans, and become a full-time carer for his aging parents during what would become a 2½-year period and the project was 'put on ice' yet again. It was not until 2017, 2½-years after the recording sessions were completed that production resumed on the CD & book project, with Helen Temperley at Winkin' Bitsy taking on the task of designing the artwork and layout for the whole package. The finished product was finally completed in September 2017, together with the accompanying 'Fair Flowers Among Them All (The 'Mad Martins' Instrumentals)' CD, and released as a 50-track triple CD housed in a deluxe 104-page book containing lyrics, inter-linking text and around 100 illustrations.